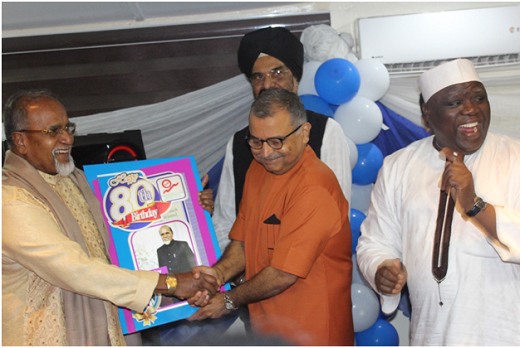 No fewer than 100 people turned up for the 80th birthday celebration of Chief Varkey Verghese, chairman, Jawa Group and president of Indian Pharmaceutical Manufacturers and Importers Association of Nigeria (IPMIN). The colourful event, which held at Hotel Smridus, Victoria Island, Lagos on 22 October, 2018 had Pharm. Ahmed I Yakasai, president, Pharmaceutical Society of Nigeria (PSN); Mazi Sam Ohuabunwa, former managing director, Neimeth International; Babatunde Ruwase, president, Lagos Chamber of Commerce and Industry (LCCI); H. S. Arora, managing director, Ranbaxy Nigeria Limited and Prof. Samson Adebaye, director of ports inspection, National Agency for Food and Drug Administration and Control (NAFDAC) in attendance. L-R: Chief Varkey Verghese, the celebrant receiving a goodwill card from Ashwin Dayalani, vice president, IPMIN while J.T. Lalvani, chairman, Therapeutics Lab. and Pharm. Ahmed I Yakasai, president, Pharmaceutical Society of Nigeria (PSN) applaud. Others were Ashwin Dayalani, vice president, IPMIN; J.T. 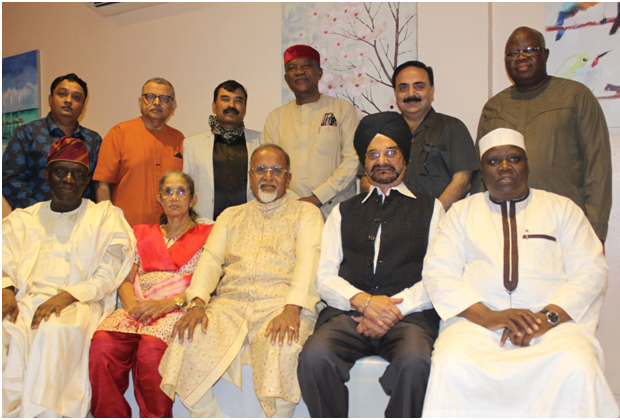 Lalvani, chairman, Therapeutics Lab; Jasbir Singh, managing director, Pharma Ethics; Folusho Ajenifuja, superintendent pharmacist, Sagar Vitaceutical; Femi Taiwo, general manager, Finance, Jawa International and several members of IPMIN and the Indian Community in Lagos. Congratulating the celebrant, Yakasai disclosed that he had to abort his trip to Kano when he heard that a get-together cocktail was being held in honour of his good friend (Verghese). 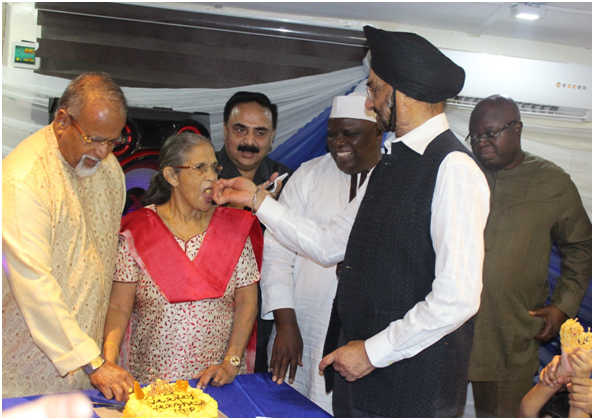 L-R: Chief Varkey Verghese, the celebrant, his wife Mrs Annie Verghese; H.S. Arora, managing director, Ranbaxy Nigeria; Pharm. Ahmed Yakasai, president, PSN; J.T. 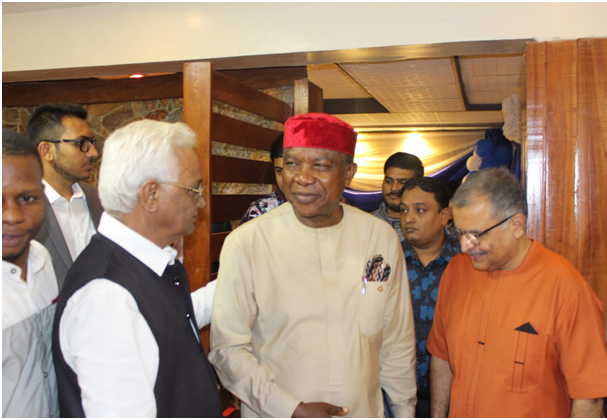 Lalvani, chairman, Therapeutics Lab., and Prof. Samson Adebaye, director of ports inspection, NAFDAC during the toast. “We have known each other since 1993 when he started Jawa Pharmaceutical. Coincidentally, that was the same year I started my company – Pharmaplus Nigeria Limited. When Verghese was asked about his vision during the official commissioning of Jawa factory, I recalled him saying that he wanted to build world class pharmaceutical products. “Today, Jawa is among the biggest pharma manufacturing companies in Nigeria. He is a strong Christian who has the fear of God and has touched so many lives. To show you his level of humility and compassion, he recently travelled all the way to Jigawa to drill a borehole for the benefit of the community in the state,” he declared. On her part, Mrs Annie Verghese, wife of the celebrant announced that she has always supported her husband throughout their union. “We have been joined together since 1968 as a young couple and we were already christians at that time. So many obstacles had come and gone, but we always come together to pray against such problems. L-R: Prasenjit Banerji, general secretary, IPMIN welcoming Mazi Sam Ohuabunwa, former managing director, Neimeth International to the cocktail while Mukesh Dudhiya and Ashwin Dayalani, vice president, IPMIN watch. “My husband is a very humble man, even at home. Even when I was really sick, I used to see him several times on his own and by my bed praying for me. I wish him many more years ahead,” she enthused.